Topics: Family Of Brands, Quiksilver Foundation, Timeline, & North America. 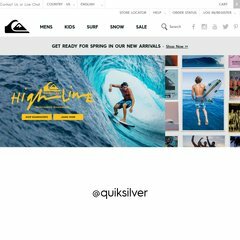 quiksilverinc.com Mission Statement / About Us / Quiksilver Inc / Quiksilver ..
374 users visit the site each day, each viewing 1.80 pages. It has 6 nameservers, including pdns5.ultradns.info, pdns6.ultradns.co.uk, & pdns1.ultradns.net. The programming language environment is eZ Publish by xrow. It is hosted by Amazon.com Inc (Virginia, Ashburn,) using Apache/2 web server. The server is faster than 55% of measured websites, at 1324 milliseconds.